Upon hearing the first track on When Summers Gone’s EP, December, it’s really difficult not to approach it from the viewpoint of a jaded music writer. For one thing, singer Dave Graziani’s vocal cadence apes a who’s-who of ’90s frontmen, such as Chris Cornell (mostly), Gavin Rossdale, and Eddie Vedder. The record’s second song, “Welcome Home,” brings a little bit more energy to the EP, albeit still in a mid-tempo manner. Having lived in Seattle during the ’90s explosion of bands like Pearl Jam, Nirvana, and the lot, I do have a appreciation for them and even a lot of respect for the bar bands that grew from those influential groups. 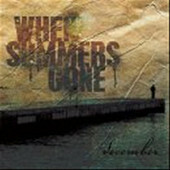 As much as I’d like to say that When Summers Gone is my cup of tea, though, they really aren’t. Even on a song like “Resolution In D,” I expect it to break out with a really cool Quicksand part, but it just stays with the same ol’ chugging and vocal lines that Graziani sings from the top of the record. By all means, December is not a terrible record; in fact, the production and songwriting are solid, if not slightly uninspired. I just think it caters to an audience that is few and far between these days.